Cam's Cinematic Episodes: Film Review - MAX PAYNE: Forget PAYNE, This One Just Hurts! Film Review - MAX PAYNE: Forget PAYNE, This One Just Hurts! It must be said that video games fell well off my radar shortly after the inglorious final death rattle of the Nintendo 64. Sure, I’ve had controllers thrust into my hands since, and half-heartedly bumbled my way through the odd round of Grand Theft Auto or HALO, but it’s safe to say that the passion pretty much expired following my active retirement from all things GoldenEye and Perfect Dark. Although for some reason I did manage to play my way through a gritty little slice of hyper-noir called Max Payne, which, interestingly enough, proved absolutely useless in attempting to assess, or even understand, the latest video-game-to-film adaptation, titled (duh!) Max Payne. 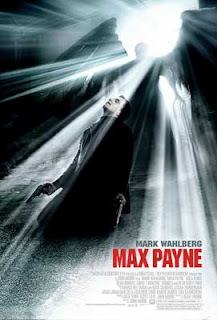 Set in an atmospheric New York City, where snowflakes always hang artily in the air, Max Payne weaves the tragic tale of Maxwell Norbert Payne (I made up the middle part), played by Mark Wahlberg, a once-great DEA agent now glumly toiling away in a dead end filing job. Why, you ask? Well, because some time back his wife and baby daughter, who apparently existed in a world of soft focus and delicate slow-motion, were killed by drugged-up madmen in a horrific home-invasion. Despite two of the intruders being handily dealt with on the spot, the identity of the escaped third wrongdoer remains a mystery, though I bet most audience members will solve this brain-teaser well before the improbably dense Monsieur Payne does. Whilst following leads to crack this tragic quandary, Payne becomes a prime suspect in the murder of a tras hy party-girl (Olga Kurylenko, who gets to engage in a seduction scene even more awkward than her one in Hitman). This misfortune brings him into contact with the girl’s sister, named Mona Sax (Mila Kunis), who, according to Wikipedia, is an assassin (but one of the film’s many poorly explained details). After an initial dust-up, the two join forces to investigate the cause of their loved ones’ one-way trip into the land of the living challenged, as well as seek to uncover the mysteries behind those shadowy winged creatures that hover like spectres of death in the night sky. Now, that is about as much detail as I feel capable of giving you, as Max Payne almost redefines the term “Incomprehensible Action Extravaganza”. I’m not sure whether to blame untested screenwriter Beau Thorne or 20th Century Fox, whose tradition of butchering the life out of their genre-based properties is infamous throughout the entertainment world, for why so little of this film makes sense. The middle section in particular got so ridiculously hazy that I began to doubt my own mental faculties. Typing this review now, I still have no idea how Payne is able to trace those two brutal murders all the way to the ominous Aesir Pharmaceutical corporation. It’s as if dire ctor John Moore and his editors removed all the connective tissue of their plot and only left in the pay-off moments. He’s also merciless with his actors (especially Ludacris and Beau Bridges), who typically show up at random, in disconnected scenes, and then disappear without mention. Kunis’ arbitrary reappearance during the climactic shoot-out is especially perplexing. How did she know where to go? 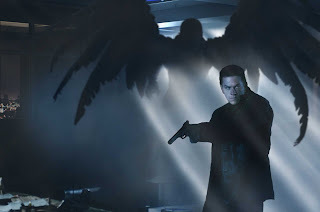 Also, what in the name of Sam Hill is up with those winged creatures? According to one character they’re called valkyries, famed from Norse mythology as being guardians of warriors. But for the life of me, I have no real idea what their purpose in the film is. Utter curiosity ov er this point even led me to Internet Movie Database, where a helpful fan named Yasifummah had posted a two-page explanation on their function in the video-game series. To be honest, after two mind-warping paragraphs I had to stop reading for fear of a brain aneurism. If anyone can logically explain their function in this film, you are a smarter individual than I.
Engulfed in the elaborately stylized atmosphere, and hung out to dry by a pathetic script, the actors are all uniformly awful. Wahlberg has two modes of expression: scowling and looking depressed, while Kunis comes close to blowing all the goodwill that Forgetting Sarah Marshall earned her. I was at least amused by Amaury Nolasco, as the evil Lupino, whose entire character seems to be based on staring menacingly down from rooftops (four separate times by my count). Max Payne isn’t simply a bad movie; it’s an aggressively unpleasant one, battering the audience with fractured, ugly images, concussive sound effects and unspeakable dialogue for 100 minutes, without ever having the courtesy to try to tell a story or entertain anyone. 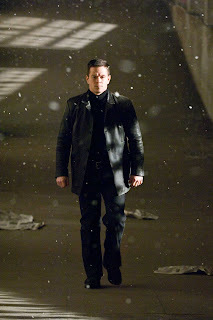 In the film’s dramatic opening Wahlberg tells us in voice-over: “I believe in pain”. Well, count me a convert Mr. Wahlberg, because watching Max Payne made me believe in pain too. *Originally printed in SFU's The Peak: Oct. 20, 2008.